Many people have contacted the Historical Society seeking help in researching the history of their house. We hope that the following will be helpful. The first thing to do is to go to the Hennepin County Property Information Search (PINS) website. This website contains public information from the county tax records. Enter your address and it will give you the year the house was built, the legal description and dimensions of the lot, whether the house is homesteaded, etc. Your name and address should also appear as owners of the property. The site will also indicate the name of the subdivision. With that you can enter the name of the subdivision and block number where indicated to get a list of all of the houses on the block. For example, if you want to know the ages of all the houses on your street, look up your own address to find out the subdivision name and block number, then enter that information to get a list of each house in that block. Click on each house on your street to get the year built. The site also has a very helpful mapping feature. There are two places in City Hall that may be helpful in your search. The first is the Permits and Inspections desk on the second floor. There they have microfiched documents for every house in the City. Give them an address and they will pull the file and let you view it on the machine. These documents are generally building permits, which may tell you when a garage or an addition was added. You can glean the names of owners from the documents as well (but be careful – often permits are taken out in the name of the contractor). These records generally only go back to the 1950s, and the first record is often a certificate of when the house was hooked up to City (then Village) water. The second place to go in City Hall is the Tax Assessors Office, on the third floor. They, too, have files on every house in the City. Your property may be titled by an Abstract of Title. The Hennepin County Tax website will indicate whether your property has an abstract of title or is titled by Torrens. Abstracts can be very difficult to understand. First of all, the descriptions of property change. St. Louis Park (Section 21, Township 117, Range 21) was first divided in 1855, so the first conveyance recorded will probably be from the U.S. Government around that time, described in 40-acre Government Lots. These lots are quite different from the blocks and lots that resulted when the land was first platted. Then there could be subsequent plats; in the Center, e.g., 2,000 acres were platted into 25 ft. lots in 1882, and those lots were often replatted when the Walker plan fell through and the land was bought up by others. Second, one purpose of an Abstract is to document clear title to the land. When the property is sold, a search is made to find out if there are any liens on the property. Often people with similar names are identified as possible clouds to the title. Those entries can be disregarded. One important use of the Abstract, especially for an older house, is to determine who owned the house the year it was built. With that information, you might be able to use the resources of the Northwest Architectural Archives to obtain plans and other documents pertaining to the building of the house. Note that if your house is titled by Torrens, there will be no Abstract. Often a good source of information is your neighbors. Look on the Hennepin County Tax website (above) and pull up the houses on your block. The site will tell you when the current owner bought the house, back to about 1970. Before that, it will say that no information is available. You may want to knock on the door of a “no information” house to see if the longtime owner has any information about your house or neighborhood. See Also Research Resources for other places to go. 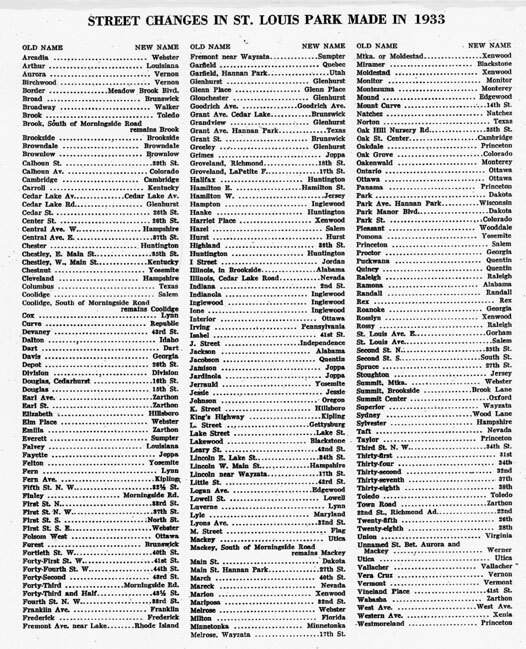 Sanborn Map Co.: www.sanborn.com Digitized historic Sanborn maps can be found online through a subscription service called ProQuest. Contact Environmental Data Resources, Inc. (www.edrnet.com/sanborn.htm) to order a subscription.